Reliance Jio has come up with a new offer for its subscribers in association with Vivo. Dubbed ‘Jio Vivo Cricket Offer’ it includes benefits of up to INR 10,000 for the Jio buyers who opt for Vivo V15 or V15 Pro smartphones during the current IPL season. A dedicated page for the offer on Jio’s official website reveals that Jio users will get benefits in the form of INR 299 prepaid plan each month. Reliance Jio took to Twitter for sharing the offer with Jio users. The IPL 2019 season boasts Vivo’s sponsorship, and now with this offer, both Jio and Vivo are trying to make the most from the league by wooing buyers with 3.3TB of data. Jio cashback for the offers includes unlimited local, national calling alongside 3GB of 4G data daily with free SMS benefits for 28 days. Additionally, users will also be able to avail up to 40 discount vouchers worth INR 150 each, totaling up to INR 6,000 cumulatively and thus resulting in a cashback of INR 6,000 by Jio. Subscribers will be able to use each voucher while recharging for the INR 299 prepaid plan and getting a discount of INR 150. These vouchers will be applicable on eligible device i.e. the Vivo phone bought under the offer. Users must utilize the coupons by July 31, 2022. Also, the vouchers can only be applied when doing the recharge using the MyJio app. Additional benefits under the offer include vouchers worth INR 4,000, Paytm cashback of up to INR 1,000 on flight booking, INR 1,200 discount on ZoomCar, INR 1,750 cashback on ClearTrip, INR 500 off on FirstCry, INR 150 discount on Myntra, and INR 100 discount on Behrouz Biryani. For detailed information, terms and conditions on these benefits kindly head to this page. The Vivo V15 price in India is INR 23,990 while the Vivo V15 Pro retails at INR 28,990. Both the phones are up for purchase via Vivo’s official e-shop, Amazon, Flipkart, Paytm Mall, Tata CLiQ, and other offline channels. 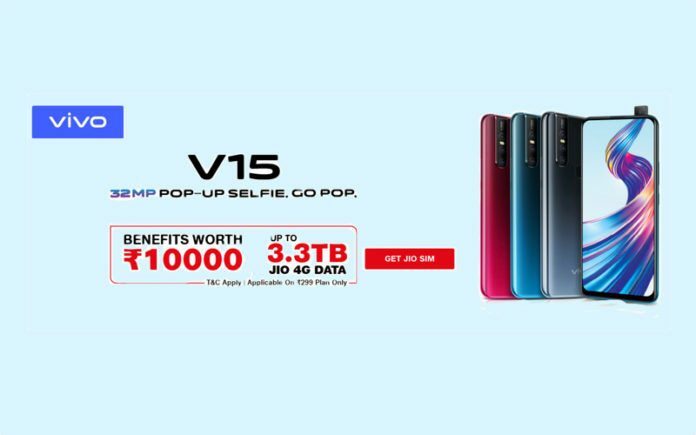 Both the V15 and V15 Pro come with triple rear cameras and a 32MP pop-up selfie camera. The V15 Pro has a 48MP+8MP+5MP triple camera setup on the rear while the V15 has a 12MP+8MP+5MP triple rear camera setup. Chipsets also differ on the two as the V15 Pro is powered by Qualcomm Snapdragon 675 SoC and the V15 settles for MediaTek Helio P70 SoC.